In between filing for divorce and the final trial, divorcing couples may use discovery to get as much information as possible to help with their case. If issues are up for dispute at the time of trial, each spouse must present evidence to convince the judge to rule in their favor in terms of custody, alimony and related issues. The discovery process helps each spouse accumulate the evidence he or she needs. When a divorce case is contested, meaning spouses do not agree on getting a divorce or the terms of the divorce, such as property distribution or custody, the case will likely involve discovery. Discovery is a legal process that allows each spouse to request information from the other spouse, as well as any other people who may have helpful information. By retrieving needed information, you can better prepare for the divorce trial or settlement negotiations. While the rules for discovery may differ by state, the process generally begins as soon as the petition for divorce is filed and continues until the deadline set by the court, often a month or two before trial. A subpoena is a legal document that orders a person to provide testimony or produce records for your case. Typically, subpoenas are used to get information from third parties, or people other than the spouses getting divorced. The subpoena must be served, meaning the document must be delivered by an adult other than yourself such as a sheriff or process server. The person or organization that receives the subpoena must comply with the request unless they have a valid legal excuse. In addition to serving the subpoena on the third party, you must also submit proof of service to the court. In some states, the discovery process begins with each spouse submitting a financial disclosure or case information statement. Even when not requested by the other spouse, your state may require each spouse to fill out a form with detailed information about income and assets. Additionally, one spouse may send interrogatories or requests for admission to the other spouse, which have a list of questions or statements the spouse must answer or confirm. Another discovery tool is notice to produce, which requires the other spouse to send requested documents, such as bank statements or tax returns..
During depositions, a spouse or her attorney will meet with the other spouse or another witness to ask a series of questions under oath. Depositions do not take place in court, but instead usually take place at an attorney's office and may take several hours or even several days. The questions are asked in front of a court reporter or a videographer. Like other forms of discovery, depositions allow the spouse to accumulate more knowledge and evidence to help her case. 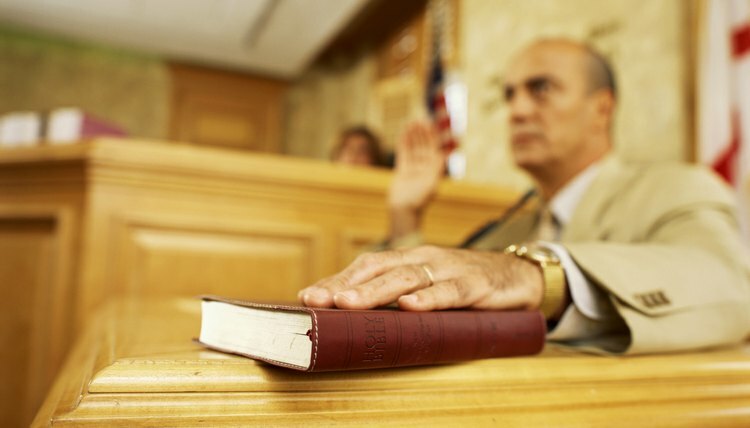 At trial, you may use the records to point out any inconsistencies in your spouse's or another witness's testimony. Professional opinions may also help either spouse's case at trial. During the discovery process, a spouse may request services from a real estate appraiser to determine the value of the marital home. Additionally, a psychologist may be consulted to determine the mental health of the child and the parents, to aid the court in making the best custody determination. Can Documents Obtained by a Private Investigator Be Requested as a Discovery in a Divorce Case? The State Bar of California: What Should I Know About Divorce and Custody? Can You Be Deposed in a No Fault Divorce? A deposition is a formal procedure in which the parties to a divorce gather information from each other before a trial. In a no-fault divorce, there may be factual issues in dispute such as income, property, support or custody, even if the parties don't have to prove wrongdoing to get divorced. By getting relevant information out in the open, depositions help the parties reach a mutual settlement before trial, or at least can streamline the issues to be decided during the trial. With all states now offering some form of no-fault divorce, the necessity of hiring private investigators to get the dirt on a spouse has diminished. In a contested divorce case, however, evidence can become critical — especially if you're seeking alimony, child custody or, in some states, property division. Claiming marital misconduct in a complaint allows the judge to consider your allegations, but you'll need to produce evidence that proves your claims. If your spouse walks out of the marriage, the financial consequences can blow through your life like a cold wind. Your share of the assets depends on the length of your marriage and the laws of your state, but every divorcing spouse is entitled to learn the details of the other's financial situation. You use the discovery process to obtain that information.